Students kicked off the official start of Spring on Friday with a celebration as colorful and joyful as the season itself. 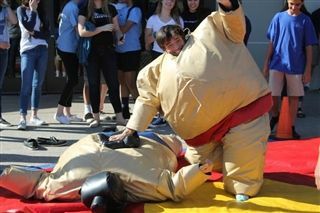 Students faced off in inflatable sumo suits, got clingy at the velcro wall, defied gravity in the bounce house, and caused a 'racket' at the badminton nets. Freshly grilled BBQ and a s'mores station provided plenty of fuel for the fun, and a performance by the Pacific Ridge Improv club brought laughs to all.